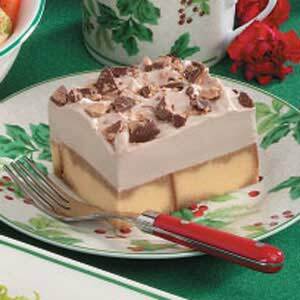 Here is a nice twist on tiramisu, with the Heath Bar topping. I like to make versatile. homemade pound cake, making extra loaves, and freeze them for when I need a quick treat. Homemade is so much better for you! Cut cake into nine slices. Arrange in an ungreased 11-in. x 7-in. dish, cutting to fit if needed. Drizzle with coffee. In a small bowl, beat cream cheese and sugar until smooth. Add chocolate syrup. Fold in whipped cream. Spread over cake. Sprinkle with crushed candy bars. Refrigerate until serving. Yield: 8 servings.